CAP’N LEM is back in the water! Lots of hard work but uneventful. Ken is here to help and enjoy the coast of Labrador. I convenced him Labrador is just too good to be missed. The Ice! She's a melting! A lot of work had been accomplished in my days here at Goose Bay. Fix this, fix that, paint it, stow it, re-stow it. The food stores I’ve carried 4414 miles in the shower are onboard the CAP’N LEM. Now I can shower without a major movement of can goods and cereal boxed. I’m sending the “Inflatable Parrot” into reserve duty status and bringing the good and faithful kayak to the front line. As you’ve learned by now, most everything has a name and a story to go with it. With the Gray Ghost, the stories are many! A fellow ask me, “Tommy, why do you have seven boats?! !” I told him, “Because I sold one”. 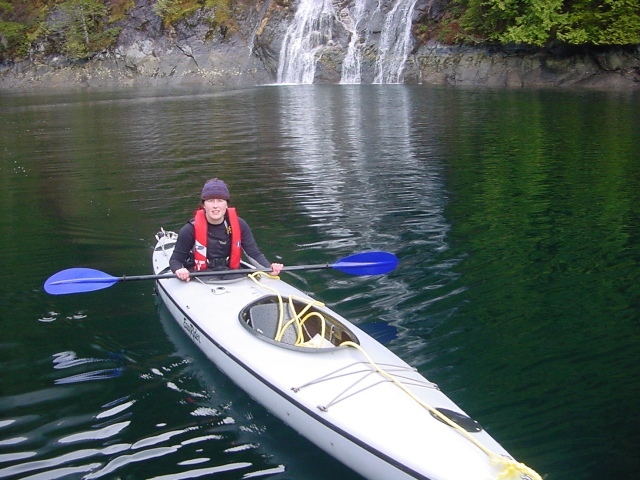 Of all the boats I have own over the years, my 17’ double seat, Kevlar reinforced, Easy Rider Bulge kayak will always remain the one “not for sale”. In our younger days, (we were both younger once) I dressed her bow with names of the exotic places I had paddled her. They have long since washed away but the letters left marks that close inspection reveals names; Palmer and McMurdo Station Antarctica, Hobart Tasmania, Tonga, Princess Louisa Sound BC, Puget Sound, Lake Washington, Acapulco Mexico, Victoria BC. It is only fitting that the Gray Ghost accompanies me on my way north. To complete our discussion of heavy lifting we must address a component so vital that without it blocks would be useless, winches; mere toys, lines; just string, it just wouldn’t work without knots! I used two knots and two knots only in rigging to move the CAP’T LEM, the carrick bend and the swifter hitch. I secured the block and tackle to the winch post on the trailer using a short line by taking it around the winch post and through the block several times then tying the ends together with the carrick bend. Although a great deal of force is exerted on this line, the load is shared and dispersed over the several wraps and did not exert that much pressure on any one wrap. 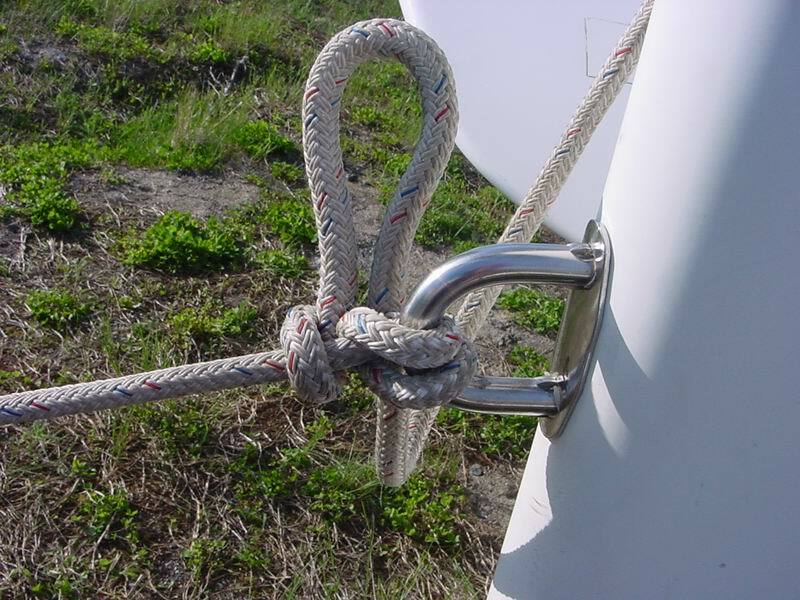 The carrick is one of those most useful of knots. Like the bowline and round turn and two half hitches, its weave and shape are second nature to the true seaman. It’s a strong beautiful knot often used as the basis of fancy rope work. It’s easy to tie and easy to untie. Most every knot a sailor uses must, at some point in time, be untied. It is in the untying that the carrick bend becomes a king among knots. 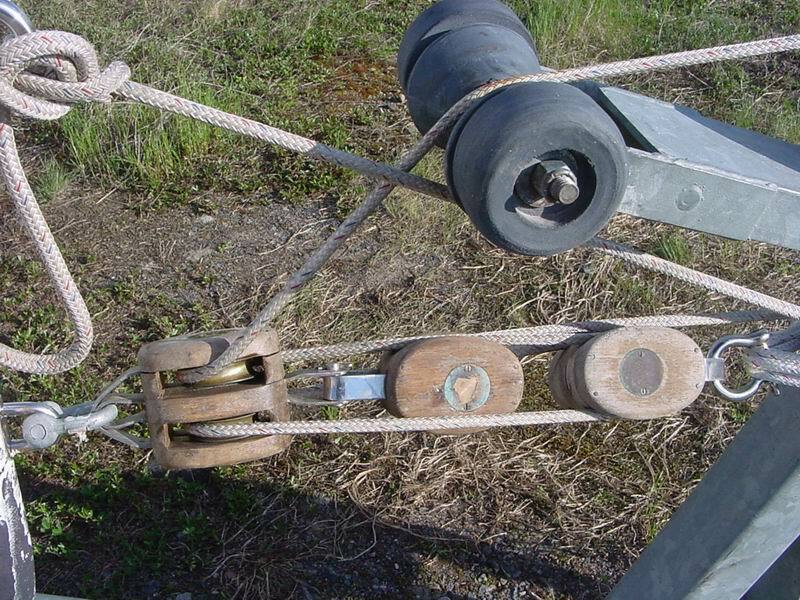 Lines bent together and put under a heavy strain such as towing or anchoring can still be untied once the strain is removed when the carrick is used. Not so with the square knot! I used the carrick bend to secure the block and tackle to the trailer. 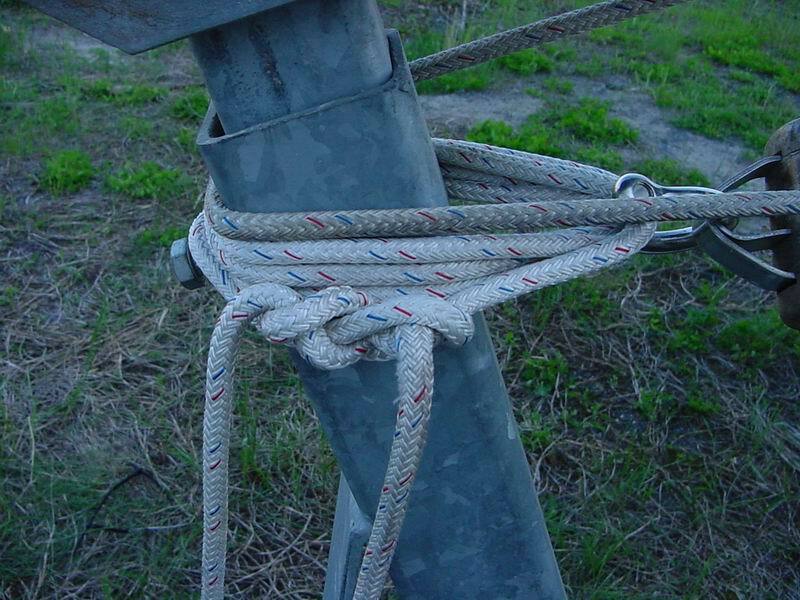 But even the carrick fails to meet the second purpose because the line must be slacked in order to untie the knot. For the second, I needed a knot that could stand the strain without coming untied, and also be easily untied while still under the strain of moving the CAP’N LEM. I also needed complete control over the line and the load to test if anything would slip when the pressure was relieved. Only the swifter hitch has the character of being untie-able while the line and knot are still under load. So, it was the swifter hitch I used to secure the bitter end of the line to the bow of the boat for the winching process. 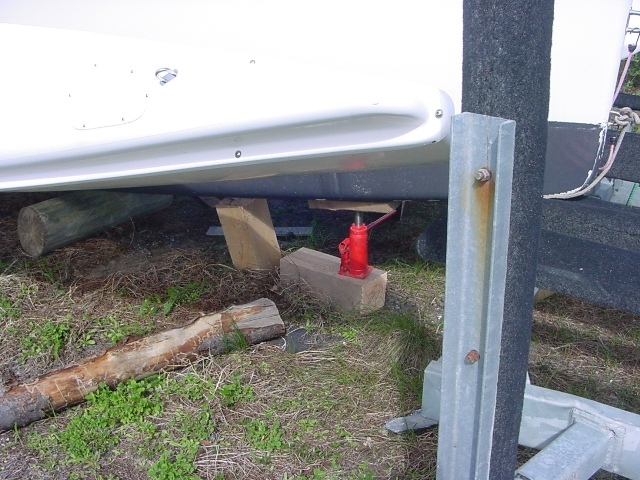 The boat would move in relation to the trailer 6 or 7 inches and it would be time to re-block, strip off the line layered on the winch and re-set the tackle. Even though the tackle and winch would still be under this incredible strain, I could un-tie the swifter hitch, ease out enough slack to see that nothing was going to slip, re-set everything and repeat the process. To make it even easier, I tied the swifter with a slip so all was need to release the knot was a smart yank and control was instantly in my hand. Why am I taking the time to tell you all these things in such detail? Because, there is something to be learned from getting the CAP’N LEM off the ground and back to the water. There is encouragement to be had from methodically solving problems one step at a time by reasoning through the details of the process in the mind’s eye. The principles of leverage, mechanics, force and friction are faithful and can be trusted to build the advantages needed to overcome a daunting task. And because, there is an immense satisfaction to lifting a very heavy object and putting it in its place. 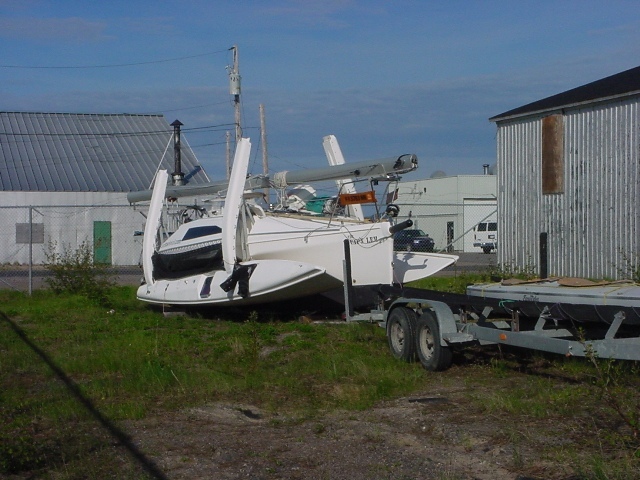 Launching and recovering a boat in the water with a trailer is easy. Floating things fall sideways with very little effort. A boat floating can be moved by the slightest of wind and sometimes remarkable fast as I experienced on Lake Superior when CAP’T LEM sailed a steady 5 knots with not so much as a ripple on the water. But a boat on land is entirely different. Next visit to a boatyard, notice all the sorts of contraptions used to move them on land. Travel Lifts, cranes and slings, dry docks and railways. This will give some idea of the obstacles that must be overcome when a boat is out of water. The boat weighs 3500# + or – but mostly +. The trailer winch will exert 1500# force on the first wrap. With each successive wrap the force lessens until on the final wrap of the drum it only exerts 700#. 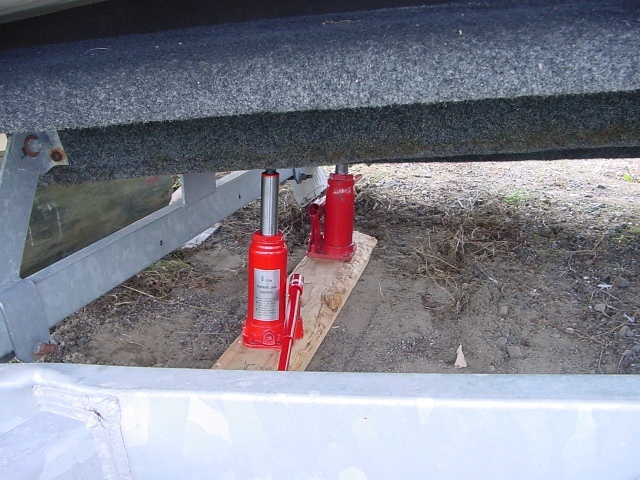 I must still deal with a lot of weight and a lot of force so, at first, I transfer most of the weight to the hydraulic jacks. One might say I am floating the boat on the backs of the Jacks. By raising the front of the boat with the stern still resting in the sand and letting the trailer come up in the air as I winch, I steal away much of the weight and the friction. 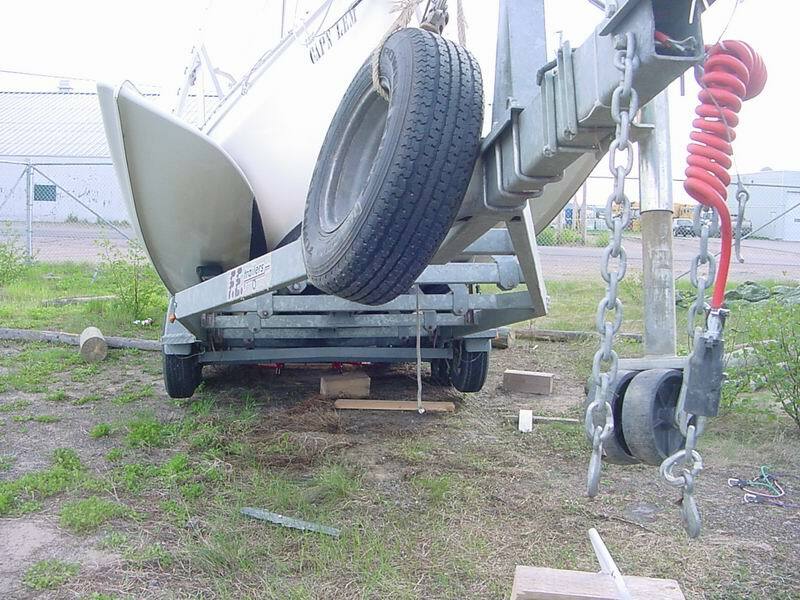 The trailer wedges its way farther and farther aft until a point of balance is reached and the trailer stop moving under the boat and the boat then comes off the ground and slides the final distance into place. Simple! Yes, just not easy. The requirement is greater and greater force. And this brings us to the block and tackle; mostly it’s the story of the blocks, the tackle having changed out a few times over the years. There are three blocks; one double sheave, one double sheave with a becket and one single sheave. Together they can exert a force 6 times greater than that applied to the working line. So my 1500# of force from the winch can be multiplied to 9000#. But this story is so much more than friction and force, for in these three pulleys are the visible reminder of all the boats I’ve own over the last thirty years. I found them in the gift shop aboard the sailing ship Star of India in San Diego, 1981. They were so stout and lovely in the way sailors see things as lovely and so full of possibility. They made the perfect gift to my beautiful little Choey Lee Frisco Flyer, STORM TREE waiting to sail back on Puget Sound, so bought them with the last of my spending money for the month and stayed onboard when shipmates went to town, sanding and varnishing them. In those days I varnished them regularly and used them for sheet blocks and handy-billys and to climb the mast, and when I sold the boat, I kept the blocks. On my Monk Cutter, AURORA, they served as preventers and down hauls and up hauls and of course, mast climbers. (How to up-haul one’s self to the masthead, alone, we’ll discuss another time). On AVANTI, I’ve climbed the mast, main and mizzen, more times than I can remember. On the CAP’N LEM, they were instrumental in getting the boat on and off the flatbed truck the day I brought her to Goose Bay to spend the long winter on the hard. Now, once again, these three wonderfully useful things have allowed me to do something far greater than is in my strength of arm and hand. When all is done, I think I will once again take them apart, clean them and grease them, shine the brass keepers and varnish them bright. There is still great beauty left in the teak of their cheeks and today my respect for them is renewed. They have moved the CAP’N LEM 288 inches! The CAP’N LEM rests on the ground and needs to be floating in the water. That’s why I towed her trailer 4414 miles to Happy Valley-Goose Bay Labrador. No small undertaking was that in its own right! But that problem is so far behind me as to be nearly forgotten in the challenge of the next move. There are 24 feet from the bow of the boat to the front of the trailer. So the distance from Port Angeles to Goose Bay has come down to this, 288 inches. In hope some will find these sorts of problems and the various methods of solving them interesting. I’ll undertake a description of how I managed to move 4000 lbs of from the ground onto the trailer… by myself. I’ll also try to give some insight in the thinking process behind the maneuvers, too. First, it is “SAFETY FIRST!” The Laws of Murphy, like a polar bear at a seal hole, waits to smite me at the slightest violation. I think the first question I would want to know then is “why alone! Isn’t that a little un-safe?” My logic here is by working alone, I can take my time and time is my ally. I need the time and freedom that comes with it to stop, sit back, look, think, rest, walk around and talk to myself. I need to have only one set of ideas at a time, mine. I’ve never done this before and I must to be able to think it through at every stage. The friends I’ve met here are wonderful and would come to help in a minute if I ask, but this task needs be done without hast. If someone were standing around waiting to help, I’d tend to hurry. I simply must do it alone. Besides, they have already helped in so many ways. Roy loaned me his chain saw, Philip let me stay in his parking lot and use his electricity. Glenn welded up a crack in the spare tire bracket. I’m not without resources here. THE RULES OF ENGAGMENT: Never be under something that can fall on you. Block before lifting, re-block after. Never put your hand between something that can snap shut, fall down, pinch closed, or otherwise dismember. Never perform an action without first thinking, sometimes long and hard, about all possible reactions. Never forget you can’t think of everything. Know where your hands, feet, head and body are located at all times. Listen, many things will tell you they are breaking before they break. Be aware, be afraid, be careful. With all this in mind, I back the trailer to the bow of the CAP’N LEM, unhook from Thumper (the trailer must float free to find its own way under the boat), sweep clear the runners of road rocks and grit and commence the lift. Oh the wonders of hydraulics! Hydraulics is a gift of the gods. I am extremely grateful for my little red 6-ton hydraulic jack, Jack. With it, I have changed tires in the rain, (flats only happen to me in the rain) and lifted boats. I used it against a tree to force Thumper back into shape when repairing the wind storm damage. Heck, I believe I could move a mountain with it if only I had the faith. My quest is to overcome, gravity and friction. Gravity holds things down and friction holds things sideways. I need to go up and forward and to do this I must rely on the ancient principle of the incline plane. I’m told it’s what the Egyptians used to build the pyramids. Personally I think they used magic, but I have to use what I have at hand. So the trailer becomes my wedge. Block & tackle becomes my hammer. I’ve arrived back at the CAP’T LEM having traveled 4, 414 miles in the good and faithful, and I might add refurbished, Thumper. The road to Labrador City then on to Happy Valley-Goose Bay was its own brand of adventure requiring all the patients a sailor would need to cross the doldrums. What a contrast to the 70 mph freeways of Montreal to the 20 mph winding gravel of highway #500! (Perhaps I should give speeds in kilometers but it won’t. My mind never could wrap around the metric system) First it was long, very long, and dusty, very dusty! And a little rough but that’s not fair because roughness of a road is a mater of speed and speed over a rough road is a matter of patients. And patients is the prize of this whole endeavor. Without it I will get no where. So the long dusty road back to the CAP’N LEM serves a wonderful reminder of my “one mile long” philosophy of travel, “the mile in front of me”. And out of those miles one after the other came the most beautiful things, like black bare crossing ahead of me, the porcupines, and the night I spend in an abandoned rock quarry where I woke up from the stark quietness of it all. It was so remarkably void of sound as to make me sit up and drink it in. How to describe it? It was quietness as to render all other such experiences a mere shade of gray. Even the calm at sea could not be a fit comparison to this absence of sound. At sea, though wonderfully peaceful, there is always a musical background of sails flapping, booms creaking, wavelets slapping, and things to do the instance of awakening, but here, on the road to Labrador, no sound was needed and none was made. I listened a long time and made note of the experience as one not to be forgotten, a new standard by which all life’s noise can now be measured. The good CAP’N faired the winter just fine. Oh, the tarp was blown to shreds like the sails of a ghost ship to indicate what she had endured but otherwise all was just as I had left her. The biggest worry was that some of the food might freeze and burst and then be flyblown, so I had bagged everything that might freeze and brake open in plastic. I’m happy to report I still have an ample supply of sardines, canned chicken and peanut butter. I’ll dig deeper later. My heart felt thanks to the good friends who looked in on her from time to time. Labrador is filled with kind and helpful people. 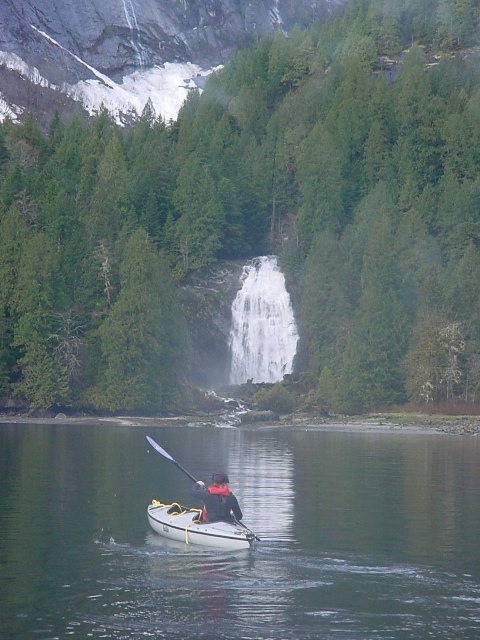 These qualities go with the nature of people drawn to live close to and in wilderness. The ice edge is moving up the latitudes. 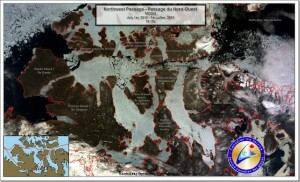 I’ve been told there is still ice off northern Labrador. I managed to pick up two days on the road even with all the work required to put Thumper back together. My plan was to be here no later than the 15th of June and I made it on the 13th. Still, my margin is thin, but it’s early yet, and I have my list of what must be done. So, like the road done one mile at a time, I’ll do the next indicated thing. You are currently browsing the archives for the Goose Bay / Happy Valley category.